August 12, 2009 The sixth Nritya Sangam Dance Festival (March 25 to 28, 2009) by Sangeet Natak Akademi held at Rabindra Sadan in Kolkata in association with West Bengal State Music Academy, Government of West Bengal and Anjika, Centre for Manipuri Dance & Movement Therapy, saw some fine performances both by seasoned dancers from the country together with some talented ones in the field of Indian classical dance, the main attraction being the introduction of Andhra Natyam and Vilasini Natyam. The four-day festival with two morning seminar sessions, was inaugurated by Shyamanand Jalan, former Vice-Chairman, Sangeet Natak Akademi, Jayant Kastuar, the secretary and renowned Kathak dancer Chetna Jalan. The opening Odissi repertoire by Anandi Ramachandran from Mumbai began with a Pushpanjali and the well-known Ram-Kewat episode from Baidehi Bilas Abhinaya, choreographed by Ashoke Ghoshal set to music by Raghunath Panigrahi. Aravi Pallavi that followed was a fine number where Anandi's graceful movements unfolded with the elaboration of the music. 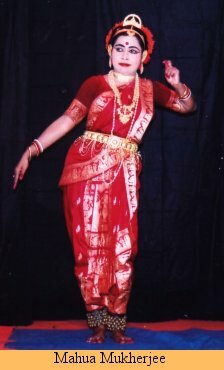 Even though she is a competent dancer, her portrayal of Swadhenabhartika Nayika in the Ashtapadi "Kuru yadu nandana" was not all that appealing. Madhumita Roy, a seasoned Kathak dancer from Kolkata, efficient in both the Jaipur and Lucknow gharanas, demonstrated her skills in pure dance in Teentaal with short tihais and an uncommon 10 matra also in teentaal. A bandish in Malkaus and the Thumri in Vilambit Teentaal, "Aise hatilo chhailo na rokata Giridhari Banwari" (Jaipur gharana) impressed. 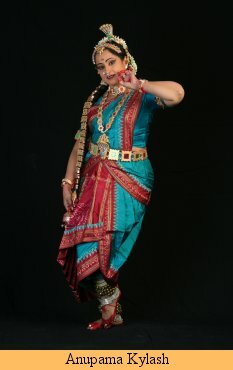 The best performance of the opening day, new to most in the packed auditorium was however Andhra Natyam by the leading exponent in the field, Kala Krishna from Hyderabad who also specialises in Kuchipudi, Navajanardhana Parijatam and other temple dance traditions of Andhra in the guru shishya parampara. His stunning and breathtakingly beautiful depiction of Satyabhama as the Virahotkantita Nayika left everyone spellbound and astonished that the beautiful, stately and extremely expressive dancer was a man in Streevesham. Undoubtedly it requires extreme dedication and understanding of the art to portray the challenge of the text both theatrically and through dance. And this Kala Krishna definitely has as was proved by his clarity and enriching lecture demonstration next morning, where he educated the listeners into the details of this rare dance tradition. But he will be best remembered as Satyabhama. Meerananda Borthakur is among the well known Sattriya dancers of the new generation. She began the following evening with Nandi, an invocation, with Vishnu Vandana followed by an interesting piece taken from Tokani Chatta (or Satra) in Suhai raag. Another trained and graceful dancer, she did full justice to Jatin Goswami's choreography in Ish Vandana in raag Kanada set to Murari Sharma’s music. Her best item was the traditional "Govinda dudha piyo" in Shyam raag and combination of Paritaal, Chatkana, Manjoti and Ektaal. Her expression of coaxing baby Krishna as Yasoda was appealing. Another scintillating performance of the second day was Vilasini Natyam, the ritual, ceremonial and operatic dance legacy of the Andhra temple dancers called Kalavanthulu, by the young extremely accomplished Anupama Kylash from Hyderabad. Trained in Kuchipudi from Uma Rama Rao and in Hindustani music, Anupama is now learning all three aspects of Vilasini Natyam, Aalaya Sampradaya, Kacheyri Aata and the theatrical presentation Aata Bhagavatham from Swapnasundari. Her repertoire touched all aspects of this art form, beginning with Churnika, an ancient invocation followed by Pallavi (Kacheyri Aata) embracing Swara Shabda Sahitya (nritta and nritya). Originally in Chatursra gati, her presentation was in the time cycle of 7, 5, 3. A hymn for Lord Vishnu (Ranga Bhogam) with swaying hastas, intoxicating eye movements, sprinkled with nritta was a delight. But the short extract from the Aata Bhagavatham - the popular opera of Parijatam left all spellbound. Anupama's stylised movements and spontaneous expressions, with the different librettos of the text when she questions Madhavi if her beauty goes to waste with a daruvu was remarkable, with vocal support by Sweta Prasad. Her discussions on the subject in the morning session were equally interesting. Revathi Ramachandran, an established Bharatanatyam dancer, concluded the evening with her able performance of Vinayaka Vandana as also Allaripu in raag Mallika. Gopika Varma, a leading Mohiniattam artiste from Chennai, impressed with her elegant agility in Chitrangam and Swati Thirunal's "Visheswara Daeshana karo" on the third evening. The Ashtapadi "Chandana charchita" was presented by both Gopika and the next Kuchipudi dancer Sailaja but fell short of the beauty the lyrics carry. Sailaja, however impressed with a Swati Thirunal number and a fine Tarangam. This year, there was yet again a new addition by Sangeet Natak Akademi, that of Gaudiya Nritya, the dance of Bengal of which Mahua Mukherjee is perhaps the sole exponent. Extremely learned and trained in Bharatanatyam, Nachuni, Gaudiya and Keertan Nritya, Purulia Chhau and music, she explained the intricacies of this not so familiar dance form elaborately in the morning session. Her vibrant performance included Govindadas’s Krishna Vandana in taal das pahari and do tuki in raag Mishra Bilawaal, a passionate Ashtapadi with lovely sways and style and a novel Dasamahavidya in raagmala (11 ragas) and taal guchha. 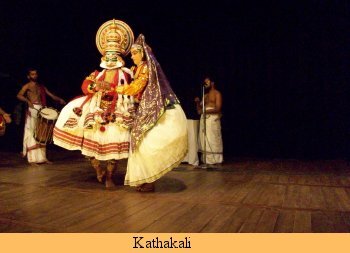 What could be more rewarding than a Kathakali recital of Ravana-Mandodari pranayam, an episode from Bali Vijayam by senior Kathakali exponent Naripatta Narayanan Namboodiri written by poet Kallur Namboodiri. The performance began in the traditional manner with a Vandana slokam, a melam, then gradual appearance of the dancer from behind the Tiraseela in traditional awe inspiring costume. It was a marvellous, spectacular presentation worth experiencing and one of the best in the whole festival. The final day saw some extraordinary elegant recitals of Dasavatar and pure dance Tanum Terana in taal tanchep by the graceful Manipuri artistes N Ajit Singh and O Debola Devi, followed by another spectacular Koodiyattam presentation of Parvatiparinayam composed and presented by the exponent Shylaja of Kerala Kalamandalam. Her performance though lengthy, was purely individualistic, intensely felt and uncommon. 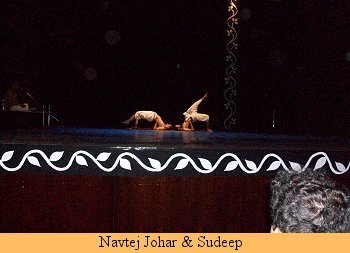 Navtej Singh Johar is one of the leading performers and choreographers in experimental dance in India and he mesmerised the audience with his controlled body movements and delicate design in 'Dravya Kaya,' a seamless blend of Bharatanatyam and contemporary number with lovely sweeps. Vocal support by G Elangovan in ragas Yaman Kalyan, Kambodi and Jhinjhoti and by Sudeep in dance added to the success of this graceful and passionate number. The festival concluded with a scintillating performance of Kathak by Harish Gangani, from the traditional family of Kathak dancers of the Jaipur gharana. His brilliant presentation of Shiv Vandana a series of bolparans, paramelu and other pure dance items, confident and easy foot-work, with the concluding Guruvandana proved that this talented dancer is not only a chip off the old block but the dance style is safe in his hands. A critic of performing arts, specialising in dance, dance theatre and expressions, and a regular contributor to the Statesman Kolkata in dance, vocal music and theatre. Trained in Kathak, both the Jaipur and Lucknow gharanas, was a disciple of the late Jaikumari, Ram Gopal Misra, Manjulika Roy Chowdhury and Gayatri Chatterjee. 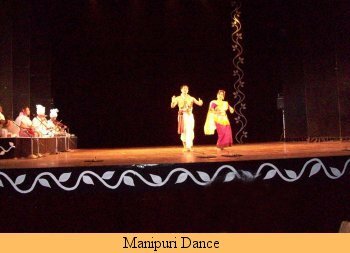 Had exposure to Bharatanatyam from Guru Maruthappa Pillai and Manipuri from Guru Bipin Singh and Kalavati Devi. Regular visitor to the festivals of UK and Europe. Also trained in vocal, semi-classical music and Rabindra Sangeet. A Science communicator, Ph.D. in Polymer Science, Commonwealth Scholar and a retired Professor of Chemistry, Nita devotes most of the time on dance and theatre writing.